With the arrival of summer, when the sun's ultraviolet (UV) rays are strongest, ophthalmologists − medical doctors who specialize in the diagnosis, medical and surgical treatment of eye diseases and conditions − are warning the public that overexposure to these rays can burn the eyes' corneas and cause painful, temporary blindness. The American Academy of Ophthalmology urges the public to wear sunglasses and hats when enjoying the outdoors this summer and all year long. A number of scientific studies indicate that continuous years of unprotected exposure to the sun without eye protection can damage your eyes by contributing to cataracts and macular degeneration and even lead to tumors that may require surgical removal. A lesser known danger of sun exposure, however, is the more immediate risk of sunburnt eyes or photokeratitis, also termed ultraviolet keratitis or snow blindness. Light-colored eyes are at increased risk for this condition because they have less pigmentation in multiple layers of the eye than those with darker eyes. Mild photokeratitis can feel as if there is grit stuck in the eyes, which is caused by layers of the cornea peeling following the sunburn. Those with extreme cases describe the condition as feeling as if their eyeballs are on fire. If people experience these symptoms, they should immediately see an ophthalmologist. The typical treatment for photokeratitis is cool, wet compresses and artificial tears for local pain. Nonsteroidal anti-inflammatory drug (NSAID) eyedrops are used to reduce inflammation and eye pain, and oral pain medication is prescribed for severe discomfort. Affected patients should also seek isolation in a dark room, remove contact lenses, avoid rubbing the eyes and wear sunglasses until the symptoms improve. Recovery usually takes one to three days. "It's important for people to remember their protective gear on sunny days," said Philip R. Rizzuto, M.D., secretary for communications for the American Academy of Ophthalmology. "In far too many cases, people think that a little redness on the skin is not a big deal; but, consider what that burn could feel like on your extremely thin and delicate corneas. Don't leave home without sunglasses and hats if you are heading outdoors." The Academy offers these tips to protect your eyes from both short-term and long-term damage from the sun: Go 100%! Regardless of the cost or color of your shades, wear sunglasses that offer 100% UV protection, make sure they block both UV-A and UV-B rays and wear them anytime you are outside or driving during the day. Choose wrap-around styles. Ideally, your sunglasses should wrap all the way around to your temples, so the sun's rays can't enter from the side. Top it off. Wear a hat with a three inch brim to supplement your sunglass protection. Beware of reflective surfaces. When at the beach or in the water; remember that UV light reflected off sand, water or pavement can also damage the eyes. Certain medications may increase your sun risk. 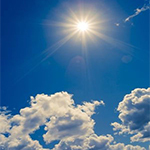 Be aware that certain medications you are taking may cause increased sensitivity to sunlight (photosensitivity). Be sure to ask your Doctor. Don't rely on contact lenses. Even if you wear contact lenses with UV protection, remember your sunglasses. Don't be fooled by clouds. The sun's rays can pass through haze and clouds. Indoor tanning is worse than outdoor. Tanning beds can produce UV levels up to 100 times stronger than the sun's rays. The Academy and other medical organizations recommend against use of these beds. For more information on keeping eyes healthy or to find an ophthalmologist in your area, visit www.geteyesmart.org. The American Academy of Ophthalmology, headquartered in San Francisco, is the world's largest association of eye physicians and surgeons — Eye M.D.s— with nearly 32,000 members worldwide. Eye health care is provided by the three "O's" – ophthalmologists, optometrists, and opticians. It is the ophthalmologist, or Eye M.D., who has the education and training to treat it all: eye diseases, infections and injuries, and perform eye surgery. For more information, visit www.aao.org. The Academy's EyeSmart®program educates the public about the importance of eye health and empowers them to preserve healthy vision. EyeSmart provides the most trusted and medically accurate information about eye diseases, conditions and injuries. OjosSanos™ is the Spanish-language version of the program. Visit www.geteyesmart.org or www.ojossanos.org to learn more.